What Is Tzitzit (and Tallit)? The word tzitzit is literally defined as “fringes,” and refers to the strings attached to the corners of the tallit, the Jewish prayer shawl. It also refers to the poncho-like mini-tallit that is worn throughout the day, often under a shirt. Here’s how the mini-tallit came to be. b) We wear a little poncho called a tzitizit, tallit katan (“small tallit”), or arba kanfot (“four corners”). For most of us, it fits neatly under a shirt. 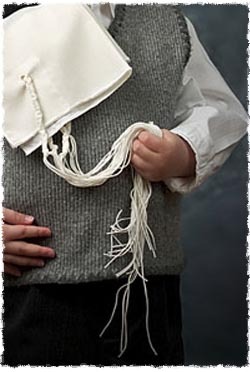 The fringes attached to the tallit of either size are called tzitzit. They are almost always made of white wool, and must be spun with the sacred intention that they be used for the mitzvah. So if you need to replace a snapped thread, make sure that you purchase special tzitzit threads. On each corner, four threads are threaded through a hole and looped over, so that there are eight strings hanging down. A series of double knots and coils then join the first few inches of each corner’s tassel into a single cord. The remainder of the eight threads are then free to hang down. The eight strings and five knots are a physical representation of the Torah's 613 mitzvahs. It works like this: Each letter in the Hebrew alphabet has a corresponding numerical value (gematria). The numerical values of the five letters that comprise the Hebrew word tzitzit add up to 600. Add the eight strings and five knots of each tassel, and the total is 613. Click here to purchase a tallit of your own. tzitzit I believe Scripture indicates that a blue (Hebrew תכלת, tekhelet, tək·ā'·leth) thread (Hebrew פתיל "pəthiyl") known as "tekhelet" itself, is included in the tzitzit. I don't see the blue thread anywhere. In fact, I received a tallit as a gift from Israel and there are no blue threads included on the tzitzit at all. Covering your head with the tallis During prayer, when is it appropriate to cover your head with the tallis. "You shall not wear a mixture of wool and linen together. You shall make yourself twisted threads, on the four corners of your garment with which you cover yourself." tzitzit I have been told that the tzitzit may be made of wool and linen mixed. This seems to be against Torah. Tallit during prayer Here are two reasons why the large tallit is word during prayer in addition to the small one worn under the shirt. Rabbi Yosef Karo (Bet Yosef 8) writes that wearing a tallit over one's head helps foster a feeling of contemplative awe. While the small tallit does fulfil the basic obligation, it is not the most optimal way of doing the mitzvah. For only in a tallit is the individual enwrapped in the garment. Since we read about the tzitzit during the Morning Prayer, it is appropriate that we do so while wearing the best sort of tallit possible.